As one of the greatest high school basketball players to ever play in ^New York City, there was no way Bill Rieser wasn't going to make it in the NBA. ^He could do things on the court that no one else could. But after a serious knee ^injury and clashes with his college coach derailed his career, Bill descended into ^a self-destructive lifestyle. He was going to be just another washed-up playground ^legend--until he encountered Christ and became something far more. Once known ^for his 44-inch leap, Rieser is going higher than he could ever have imagined. So ^if you're looking for something that will get you to that new level of trust and ^closeness with God you're yearning for, this book is your ticket! Bill's infectious ^faith will change the way you view God, His power, His Word, and prayer. BILL RIESER grew up in East Harlem, New York where he was considered ^a legend on the streets and basketball courts of New York City. His powerful slam ^dunk repertoire earned him the nickname 'White Jesus' and destined him for stardom ^in the NBA. But injuries in college and a lifestyle of excess and anger brought ^him to the brink of personal and professional destruction. Through the incredible, ^unconditional love of his wife, Carolynn and the faithful prayers of her church ^he found and accepted the Lord as his Savior. Bill is the author of Vertical ^Leap, and is currently the Director of Recovery Ministries at Heartland Community ^Church in Rockford, Illinois. He and Carolynn have been married for 25 years and ^live in Rockford. They have one daughter. One of the greatest high school basketball players to ever play in New ^York City, there was no way Bill Rieser wasn't going to make it in the NBA. He could ^do things on a basketball court no one else could. But after a serious knee injury ^and clashes with his college coach derailed his career, Bill descended into a self-destructive ^lifestyle of drinking, drug abuse, and womanizing. He was going to be just another ^washed-up playground legend--until he encountered Jesus Christ and became something ^far more. Once known for his 44-inch leap, Rieser is still looking up these ^days and his vertical leap goes higher than he could ever have imagined. So if you're ^looking for something that will get you to that new level of trust and closeness ^with God you're yearning for, this book is your ticket! Bill's infectious faith ^will change the way you view God, His power, His Word, and prayer. "If you're a fan of the shallow, fawning dreck that is 'typical' Christian ^sportswriting, stay far, far away from this book. This thing is the real deal - ^rough, gritty, honest and full of the glorious redemptive grace of Jesus Christ. 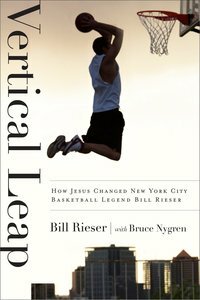 ^In honestly sharing what he's been through and put others through, Bill truly gives ^God the glory...and as Pete Axthelm proved in 'The City Game,' there's pretty much ^nothing cooler than streetball in New York City." - Ted Kluck, author of "Facing ^Tyson: Fifteen Fighters, Fifteen Stories"; "Dallas and the Spitfire: An Old Car, ^An Ex-Con, and An Unlikely Friendship"; and "The Reason for Sports"
I ^knew Bill Rieser as "White Jesus" on the Basketball courts of New York City but ^it's our frienship and shared Chrisitan brotherhood are what I'm eternally grateful ^for. His story is real and it will help those you know the key to really having ^a great vertical leap. Keep looking up and God bless!!! A former New York streetball legend, Bill Rieser now serves as director of recovery ministries at Heartland Community Church outside Chicago.